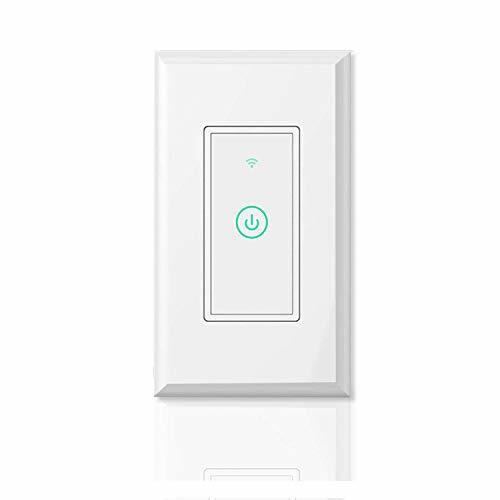 The wall light switch MSS510 can be controlled from anywhere (Internet Required) with your Meross app (iOS 9.0 or higher, Android 4.1 or higher). It allows you to turn the connected lights or fans on and off, and to set schedules or auto-off timer routine around your daily needs. Additionally, after pairing with Amazon Alexa or Google Home, you can simply control the connected devices with voice commands. MSS510 complies with US/CA wall switch regulations and can seamlessly replace your conventional wall switches. Support sunrise and sunset setting. Moreover, with the clearly designed setup wizard in Meross app, the wiring process has never been easier. Finally, MSS510 operates using Wi-Fi. You can simply connect it to your existing home Wi-Fi without the need to purchase an extra hub. Specifications Input: 100-125V~, 60Hz, 15.0A Output: 100-125V~, 60Hz Button: On/Off Button Antenna: One Internal Antenna Wireless Standards: IEEE 802.11 b/g/n, 2.4GHz, 1T1R Wireless Security: Support 64/128 bit WEP, WPA-PSK/WPA2-PSK Package Contents: 1 x Smart Wi-Fi Wall Switch, Quick Installation Guide System Requirements: iOS 8 or higher, Android 4.1 or higher, Existing Wi-Fi network Environment: Operating Temperature: 0~40 (32~104) Storage Temperature: -40~70 (-40~158) Operating Humidity: 10%~90% non-condensing Storage Humidity: 5%~90% non-condensing Neutral wire is required for the installation. Internet connection required.